Lock in a great price for The Tickled Trout – rated 9.2 by recent guests! Nestled in the heart of Ulverstone, The Tickled Trout is a 3-bedroom house located just a 60-minute drive from Cradle Mountain and the Tarkine Wilderness. The Spirit of Tasmania ferry terminal is just a 20- minute drive away. Featuring polished floorboards and original artwork, the house features a fully-equipped kitchen and a private fully-fenced garden with a BBQ and an outdoor dining area. It offers a dining and lounge area with a flat-screen TV and a DVD player. It has a full laundry and a bathroom with a large shower. There are 2 toilets. Guests can relax on the patio and enjoy the spacious backyard. The Tickled Trout is a a 30-minute drive from Gunns Plains Caves. It is a 90-minute drive from Stanley. When would you like to stay at The Tickled Trout? This house has a fully-equipped kitchen including a dishwasher. The bright and sunny lounge offers a flat-screen TV and DVD player. Guests can relax on the patio and enjoy the fully fenced, private back yard.. The Tickled Trout is a 3 bedroom holiday house centrally located in a quiet area of Ulverstone. The house has been fully renovated with a new kitchen and bathroom. It is warm and sunny, close to town, private and quiet. 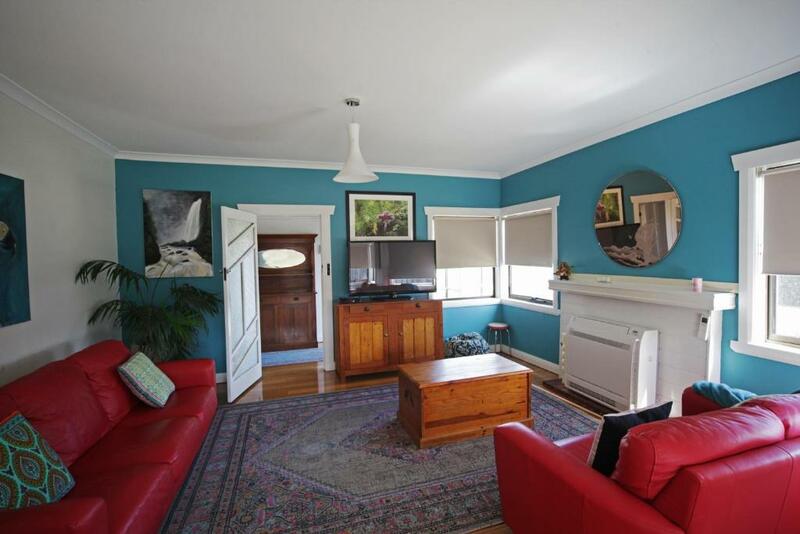 The house has beautiful floorboards and is tastefully decorated throughout. The beaches, parks and town centre are only minutes away. The house is fully self-contained with everything you and your family could need. The Tickled Trout is your 'home away from home'! This house can sleep up to 7 people making it perfect for groups and families. The main bedroom has a queen bed, the second bedroom has a queen bed and the third bedroom has a double and a single bed. There are also 2 toilets. The beds are fitted with electric blankets for the cooler seasons. A portacot and highchair are also available for use free of charge. For the enjoyment of our guests there is a flat screen LCD TV and a selection of DVD's, books, and magazines. The Tickled Trout is only a short distance from our other popular properties, Seaview House and the Spotted Salmon Cottage. I'm a lover of all things Tasmanian! The fresh air, the beautiful scenery and the laid back lifestyle of Tassie. I love bushwalking, playing golf and taking photos of our amazing natural areas. I am happy to answer all your questions on what to do during your stay. The kids will love the as it is only a short walk across the bridge to the most amazing kids playground! The beaches, river, parks and town centre are only minutes away. The house is fully self-contained with everything you and your family could need. The Tickled Trout is your 'home away from home' ! House Rules The Tickled Trout takes special requests – add in the next step! The Tickled Trout accepts these cards and reserves the right to temporarily hold an amount prior to arrival. Please inform The Tickled Trout of your expected arrival time in advance. You can use the Special Requests box when booking, or contact the property directly using the contact details in your confirmation. Lovely and clean. Close to town. Nice and quiet. Great location. Easy walk to hotel and shops. Maybe owner could take out her frozen things while renting out her home otherwise very good. Cosy neat house. Sunny and warm on those cool days and nights. lovely place. Very surprise when we arrived. Photos on your web site just don't do it justice.